Day 3 was sooooo not exciting. This is the only pic I've got to show for it. Our shower liner got put in and the drain work was mostly finalized. There's water in there now for a little testeroo. That's a beefy list there, but I'm not expecting any great changes when I get home. Electrical is fun, though! It means a new feel to the room when all is said and done. Here's our original inspiration picture that really sent the process of picking a layout forward. Listed below are the ideas we stole from this original photo. 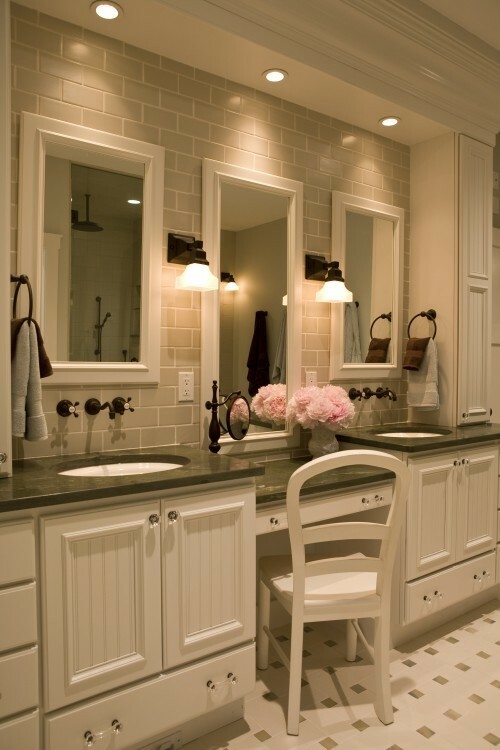 We're incorporating the sconce layout seen in this picture except our center sconce is a double. We're also doing the furniture look of the vanity. 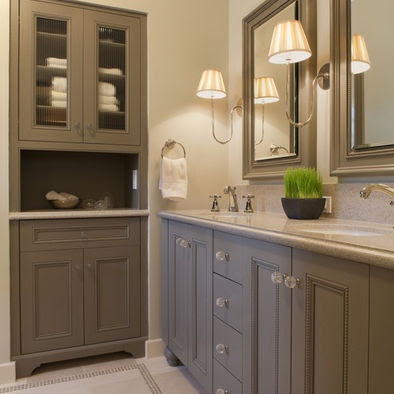 Our vanity cabinets are actually upper cabinets which means they have no "feet" and will be hung on the wall rather than sit on the ground. That gives us the opportunity to add decorative feet and make it seem more free-standing. Originally, we wanted a storage cabinet like the one on the left of the inspiration photo, but again, we nixed that for now since it was going to cost an extra $1,000. We prefered to spend that money on getting the nicer clips for our shower glass. It's always something we can add later if we decide the furniture piece isn't working out. I've grown attached to the idea of being able to switch out a piece of furniture and create a new vignette in that corner as opposed to a permanent cabinet that wouldn't be cheap to replace. We are also going with the same type of mirror look. I searched high and low for fairly inexpensive mirrors and could NOT find anything I liked. I just couldn't swallow spending even $200 on ONE mirror, let alone $400 for two. Then I was at Target and spotted 2 mirrors. They were the right look and a great size (I wanted some that were slightly oversized). They were black, though and $62 each. I may have already posted about this, but just get over it for a sec.) I didn't buy them, but took hubs back a few days later and they were still there but were marked down to $43 each! Score! We bought them and I plan on spraying them white to get the look I want. Kelley, maybe one light fixture could come over here? We need to update in the kitchen bathroom. What we have has an oval base--an ugly gold light.